A teacher of unconventional talents. 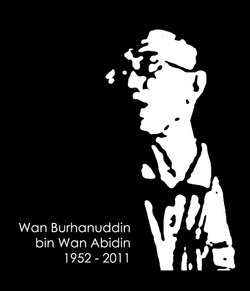 The Godfather of Niat-Laku-Hasil and without it, The Architecture School of HBP would be lifeless and barren. Without boundaries, his provocateurs drove his students breaking boundaries, all the way to the Dean's office. Almost a maverick and well lived his golden days of Hippies, John Lennon's music and baby boom, his selfless dedication to live on with Bamboos andMushrooms, not forgetting teaching architecture in a Neo-Bauhaus traditions of Bucky-Balls, Confrontations of the COLUMNS, Mask-ed!, Play and all sorts of Jingles that can only be the brainchild of a reluctant genius. Early encounter of him would be puzzled for he is draped in the defunct Al-Aqam's Jubah smoking his beloved Gudang Garam with his Teh Tarik in a lecture hall which proudly displayed the Non-Smokingsign. Who cares, as he lectured and criticized the inconsistency of translating Architecture from English to Bahasa-Whatever... and 2/3 of the Lecture Hall dose off to sleep. Yup, that is HIM! Before long, he stood before me as the Studio Master with another maverick, Encik Haidar, as his assistant, in his most up-kept beard and GUCCI to ARMANI from head to toe, the Gelugor way of course. Local-U paycheck would not entitle you to dress liked Karl Lagerfeld. The entire year was a Blessing in-disguise. Instead of drawings liked all Architecture school does, we toyed withFire. Almost got the Studio burnt down while shouting Nodus dan Laluan. Just a leap away from beingObsolesces, we did what others view as Anti-Establisment. That is way before Namewee made his debut with his Negaraku-Ku, the Architectural Prodigee would have already transformed donated Tees, Boxers and all the discarded fabrics into the Malaysian Flag and hung it in the Foyer for Merdeka Celebration,although we already knew that we had never been Colonized. There would not be another CheWan in HBP, for sure. Although we had all grownup out of his MOLD, somehow there is always a fraction of him that lived within us. A fond memory of him as a teacher and a companion of our architectural upbringing. Back in 1997, I had the privilege to study under the fold of now, Prof Edward Ng, formerly Senior Lecturer of the School of Architecture National University of Singapore (NUS) under the auspice of the Singapore International Foundation's or SIF, now defunct, ASEAN Fellowship Programme. He has been instrumental in departing his knowledge in the essence of Urban Design, where every building has its place within the matrix of any given urban morphology. Departing from the normal attempt to just addressing thy neighbor existing building, we were drilled to even correspond diligently to the scale, elements, connectivity of our neighboring "to be built" building. His inclination to architecture without a specific forms of style has been over glaring that had tormented us for the entire year. Often mistaken with his demeanor in unpolished outlook of a seasoned biker in jeans and T-Shirt, complete with a crew-cut hairstyle against a square jaw, with his heavily accent HongKy English, he often narrate his student years in Cambridge, toying architecture with personality liked Norman Foster and the liked. For once, his anecdote of - "Good design is very hard to create, but very easy to identify" and "There is one student who had only drew 1 presentation drawing that had brought him to graduation... I have not seen that yet" have been playing in my mind since then. Gladly to know that he had since elevated to Professorship in Chinese University of Hong Kong and had many awards for his pioneering work in Social-Architecture.